With lifters from colleges and universities from all over the nation, USAPL Collegiate Nationals is arguably the most exciting meet in the country. This year, we are fortunate to have Josh Rohr hosting this meet here in Atlanta. Josh is both an experienced meet director and former collegiate lifter so he knows what's required to ensure lifters garner a first class experience. With over 300+ lifters the competition is intense. The competitive atmosphere is arguable the best in the country. Lifters will experience teammates cheering them on and a crowd that will bring an electricity like no other meet you will ever see. 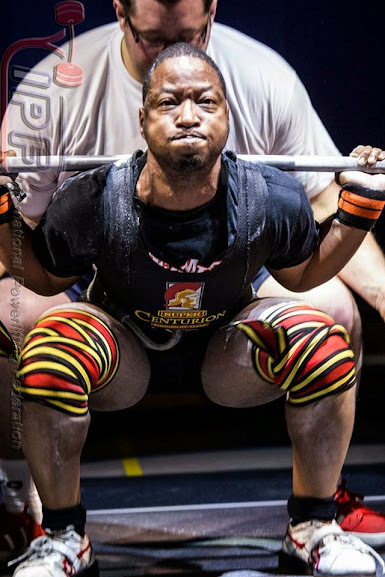 Winning or placing in a weight class may represent the pinnacle of a powerlifter's career. With strong high school powerlifting programs, teams from the states of Louisiana and Texas have historically taken the team titles. The University of Georgia is currently the only Georgia School to introduce a team at Collegiates. This year however, we can expect to see teams from UGA, Georgia Tech, and Georgia Southern and hopefully eestablish a long tradition going forward. Although this meet is known for its team competition, powerlifting is inevitably an individual sport. Collegiates is open to any lifter who is a full time college student and 25 years old or younger regardless of whether their school has a powerlifting team. It is also one of two meets where lifters can attempt to qualify for the Junior National team to represent the USA at IPF Junior Worlds. The following list is compiled of lifters either from Georgia schools or lifters who have moved to Georgia after Collegiates and are still involved in powerlifting. Although Georgia has not had the same team involvement other states have, Georgia has produced some very impressive collegiate lifters! 1999 242 class, Ft. Wayne, In. 2000 242 class, Colorado Springs, Co.
What are your favorite memories of Collegiates? My favorite moments are always eating food with my friends after competing; 2012 (steak), 2014 (dinner with friends). During the competition itself, I do enjoy the final moments of the dead lifts, crowning the champion. You started a program from scratch. Tell us about your collegiate career. The 2003 collegiate nationals was my second meet ever and it was my first national meet ever. I can honestly say that the 2003 collegiate nationals is where i became obsessed and in love with the sport of powerlifting. In the fall of 2003, while at Ashland University, myself and another female powerlifter that I had met started a team because we saw how awesome it was to have a team at collegiate nationals. I remember seeing LA Tech, LSU, Ball State, ULL, some of the large teams and the commoradory that they had. Being from a small school, we were never to reach the size of an LSU or LA tech but we prided ourselves in quality. At the 2003 Collegiate Nationals, Tiffany Sommers (the girl that co-founded the team) won the 181 class. The following year in 2004, Ashland University took 5 lifters to collegiates. I was fortunate enough to win the 165 weight class. 606 was loaded for my 3rd deadlift and I needed it to win. It was the longest deadlift I have ever pulled but I finished it. That win qualified me to compete at the 2004 IPF Junior Worlds in South Africa. In 2005, Ashland University took 5 lifters to Collegiate Nationals, one of them being Hope Hunt (now in Atlanta). 4/5 of us bombed out, including Hope and myself. This was the lowest of the low, especially for me being the returning champion and the fact that I was now coaching everyone. This still goes down as my lowest point in powerlifting. I had not done my job in preparing my team or myself and it showed. However, in 2006, my senior year, Ashland University again took 5 lifters to Collegiate Nationals in Miami, FL. We had 4 guys and 1 girl. 3/4 of the Ashland men won their weight classes and we placed 3rd in the men's team standings with only 4 lifters - something that has yet to be duplicated. We placed ahead of some teams with 30+ lifters. To me, this is my favorite moment in my powerlifting career, even above my first national title and my first medal at Worlds. This was my first team placing at Nationals - lifters that I had coached and helped become champions. I think that was the moment that I wanted to coach powerlifters for a living. What is your favorite thing about Collegiates? Never in my life besides Collegiates have I had the opportunity to crush the dreams of 40 people in a single weight class. What was your favorite memory from Collegiates? Favorite memory was getting my first 700 squat, then immediately coming back for 727. What makes this meet so special? The meet is so special because when you walk in, you're immediately surrounded by dozens to hundreds of people stronger than you, which in this world of local lifting and record chasing is pretty rare, and in my opinion is the exact point of powerlifting. What is your favorite memory of collegiates? Collegiates is so special because of the competition and the build up before hand. Someone is always talking about the next best thing and then seeing if that lifter performs. 4th Place 242 lb class, 2000 Collegiates, Colorado Springs, Co.
3rd Place 242 lb class, 2001 Collegiates, Alexandria, La. 4th Place 220 lb class, 2003 Collegiates, St. Louis, Mo. What makes Collegiates such a great meet? Collegiate nationals is the best meet the USAPL has to offer and has been for a long time . The indivual and team competitions and rivaleries can't be matched by any other meet. The best national meet atmosphere I have ever witnessed was the 2001 collegiate nats in alexandria , the crowd was huge and very loud (standing room only), the competition was fierce, I have never been more fired up to compete at a meet !!! Powerlifting is an unlikely adrenaline sport, but Collegiates is a room packed full of 18-23 year olds oozing adrenaline, hype, and drive. 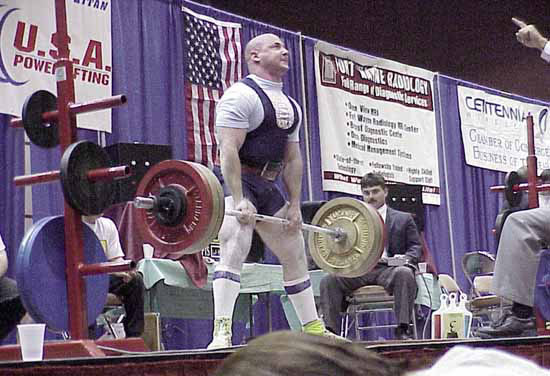 Powerlifting is also very much an individual sport, comparable to golf. While you may be competing against someone else, your opponents performance does not affect your strength and performance that day. While there are different levels of strength, there are not different levels of effort. Everyone is giving 100% even though the weights people are lifting are different. Hands down, the coolest part of the meet was watching a blind lifter compete. While I was in a heavier weight class, both she and I were giving it everything we had that day. We both played the best hand with the cards we'd been dealt and didn't leave a single kilo on the platform. Being in an environment that has its own pulse because of all the energy, excitement, and effort was definitely the best part of Collegiate Nationals. The Bronze Medal wasn't too shabby either. The best thing was the teams that were there and everyone supporting and yelling for each other. That added a great atmosphere to compete in. My favorite memory of Collegiates isn't the competition itself. It isn't the huge venue, the amount of lifters, or even the quality of competition faced. My favorite memory stems from the fourteen hour drive me, my coach, and teammates took to get there. We were broke and couldn't fly but it didn't matter because just like every other meet the camaraderie experienced between the guys was what made the trip worthwhile. Traffic and directions were bared easily in light of jokes cracked, stories told, and big numbers discussed as we strategized the upcoming meet. That's what makes powerlifting what it is to me pushing everybody to be better and forging friendships in the process. The fact that there are almost 400 college athletes competing in this meet. Compared to the other national meets, where they have the same amount of competitors but from all age groups. What is your favorite memory from Collegiates? My favorite memory is the feeling of placing in the top three and having the support of many people that I don't even know. Hunter is actually the only scholarship powerlifter in the state of Georgia! What is your favorite memory about lifting at Collegiates? As for my favorite memory from the meets, it would probably be traveling to Texas and flying in an airplane for the first time with my coaches Mark Freeman and Brooks Conway, Vang, and my family. Before that meet, my family hadn't traveled much, so Texas was a huge trip for us, especially since we were all getting on a plane for the first time. Also, it was awesome knowing that my first plane trip was happening because I was going to compete at a national meet for powerlifting- most people can't say that's why they got on a plane for the first time. And seeing other lifters from schools around the country board the same plane as us to compete was awesome too- it was a cool opportunity to meet new people and an amazing experience for my college career. What will you remember the most about lifting at Collegiates? It was a huge meet, everyone was so pumped. And I think knowing that I actually had a shot to place. Everything about it was fun. Even though I only got 8th, I left knowing I gave it my all. I think a huge part of it was just feeling proud of myself for cutting over 20lbs and still being able to hit the numbers that were my max at 181. So no matter what, I knew I had still succeeded and reached my goal. Arthur represented Valdosta State in 2014 but will be representing Georgia Tech in 2015. What is you favorite memory from Collegiates? My favorite memory of collegiates last year would have to be my last deadlift... It was my first ever equipped meet and I was pulling to move from 7th to 5th to medal and even though I missed it, I'll never forget the effort I put into it. I loved the people I met there and friends I made. Competed with friends so that was great and getting to represent my school.. Amazing experience...definitely would never pass up an opportunity to go. What do you remember most about Collegiate Nationals? I competed in the 1993 and 1998 Collegiate Nationals. I took 2nd in 1993 in a tightly contested battle, and 3rd in 1998. I was more proud in 1998 as I was a full time student at Arizona State, married with my oldest daughter, and trained sporadically. They were my first competitions with real teams of lifters supporting each other. I thought it was great that everyone was pulling for each other lift after lift. In my 25+ years in the sport I have never seen the excitement that a collegiate nationals brings. Super tight competition in all classes both mens and womens brings out the best in every lifter. The level of competition is superb as well. I thought I had a pretty good shot to win then TWO lifters broke the total record!! One of them being a future IPF World Champion. 8th Place, 2012 Collegiates, Baton Rouge, La. 3rd Place, 2011 Collegiates, Scranton, Pa.
5th Place, 2012 Collegiates, Baton Rouge, La. 6th Place, 2010 Collegiates, Orlando, Fl. What are your favorite memories from Collegiates? No lifter forgets their tightest wraps, burst blood vessels and torn callouses, or the sadistic satisfaction of "leg day." A credit to Coach Scarpulla and my Army teammates, anybody who witnessed his infamous pre-lift smack to the neck caught a snapshot of the intensity and focus of our sport. What are your favorite memories from lifting with the Army team? ... Interestingly, I trained as a football player and wrestler under Ryan Goldin in Georgia long before picking up competitive lifting in college... I loved the mix of camaraderie and accountability, because it removed excuses and blame often found in other sports to make the team sincerely close... Powerlifting broke me free from my own ceiling of expectations, and I'm thankful that mindset carries self-confidence forward today.